Sneaky Ninja coming to Nintendo Switch! It’s been a long time coming, but we can finally announce that Sneaky Ninja is coming to the Nintendo Switch in early 2019! Check out the new trailer above to celebrate! Work on finishing Sneaky Ninja has been progressing slowly but surely since the last update. Slower than expected, to be honest — being married now brings a whole slew of brand new time management problems I’m still adapting to (sorry dear!) — but progressing nonetheless. I’m really sorry to say I don’t have a solid release date yet, it really seriously honestly is around the corner… but unfortunately, objects in the game-dev-view mirror are always closer than they appear. It’s really shaping up great though, so hopefully you’ll agree that it was worth the extra time once it’s in your hands! Since the last Kickstarter update, I’ve shared the first clips of a later level on our Facebook and Twitter, so as always, be sure to follow those if you want to see sneak peeks as soon as they’re up! This chapter sees you infiltrating the Samurai kingdom, making your way through enemy villages where towering pagodas and bustling marketplaces add new spins to your sneaky adventure! Deep in enemy territory, Taro runs over rooftops and bounces on strings of lanterns to avoid the patrolling guards. If the rooftop is too heavily guarded, you can sneak indoors for an alternate route — stay tuned for a clip of that next time! Taking in the village scenery. It’s peaceful when Samurai aren’t trying to kill you! Here we get into two of the big gameplay changes introduced by the crowded markets (slightly inspired by Assassin’s Creed’s unique “social stealth” mechanics!) affecting two of the most crucial aspects of stealth: sound and vision. The loud murmur of the crowds drowns out any sound made by a scheming ninja; even on the highest difficulty, enemies won’t be able to hear you walking, landing, or even running, whether you’re ten feet away or right behind them! Use that to your advantage to cover ground quickly. With all this commotion going on, it’s easy to lose a face in the crowd. Standing among groups of villagers provides excellent cover as patrolling guards stroll right by. Be careful, though: normally you can safely sneak attack any Samurai by pulling them into your hiding spot, but don’t forget that this IS a Samurai village — they’ll stick up for their guards once they know what you’re up to. They’ll break up any attempt at a sneak attack they see, and once they’re alarmed, you won’t be able to get away by slipping back into the crowd. In August, we brought Sneaky Ninja down to Super Smash Con for the third year in a row — perfect record of 3 out of 3! It was an absolute blast as always, and the reception was great. We got a ton of valuable feedback for tweaking the game, and we defended Sneaky Ninja’s honor (and its discounts and free codes, too) in a Smash setup right at our booth, which was a weekend-long rollercoaster of pain and glory. I gotta start training for next year’s runbacks! So there’s the update roundup since last time. More is definitely coming soon, so stay tuned to Facebook and Twitter to see it as soon as it’s up. I really really really want to have release news soon, but I also don’t want to promise any more dates just yet. Talk to you again soon! It’s been a little while, but as promised I’ve been hard at work these last few months. It’s hard to take time away from work to do a big update, and I also wanna leave SOME surprises for the full game, so I don’t know if I’ll be doing any more of those… But, it’s only fair to give some sneak peeks here and there! I’ll probably be doing more small scale updates like this, once a week hopefully, leading up to launch (launch?! Keep reading for more on that!). So here’s a quick look on Chapter 3: Umi Shoals. As you can see, it features a vast ocean dotted with islands and a new swimming mechanic! Gameplay will have you traversing between land and water frequently, each with their own unique aspects and ways of hiding from enemies. For example, underwater you can swim unseen behind those schools of fish, hide in seaweed or giant clam shells, while avoiding enemy Samurai patrolling in little compact submarines (they can’t swim, after all!). Sneaky Ninja update – Chapter 5: Shiro Peaks! Shiro Peaks is as pretty as it is cold! Mostly just cold though. A Detailed Look at Chapter 2: Bento Plains! Grain and rice make for very handy hiding places to help you sneak past enemies, and as you can imagine, this stuff is everywhere on a farm. It works similar to tall grass, except it’s VERY tall! No need to duck to take cover, you’ll be automatically hidden just by being behind it — even if you’re in the air! Pigs, and sheep, and cows, oh my! You’ll find plenty of farmland friends to frolic with, but they’re not just there to look cute. All of the animals can be used as cover by hiding behind them, and they each have their own unique use that you can take advantage of. … while fluffy sheep can be jumped into like a bush, and there’s even enough room in there to pull in a samurai or two! And finally, cows can be used as dangerous weapons! Get them mad by jumping on their head a few times or hitting them with a projectile and they’ll start to stampede, taking out any enemies in their path — but be careful, they’ll take you out too! Barns provide a totally new layer to the gameplay by letting you go inside for a detour! You can jump in through any of the four entrances and jump out through another to sneak past unaware enemies on the outside. Be careful though, because samurai can patrol in barns too! You’ll see an icon from the outside to warn you where they are, though, so you don’t have to worry about jumping in blind. And that’s Bento Plains! I’ll be back next week with an update on the snow level, Shiro Mountain. See you then! It’s been long overdue, but the beta is finally out for backers. All qualifying backers have already been sent keys via email about a week and a half ago (bit slow on the announcement on my part!). If you never saw the email and can’t find it, let me know and I’ll resend it for you. Awesome news! We were lucky enough to be selected by the Indie MEGABOOTH to showcase Sneaky Ninja for all to see at GDC (Game Developer’s Conference) in San Francisco, CA. We’ll be spending the week from March 14th-18th with a lovely bunch of other indies, showing Sneaky Ninja to a whole new set of eyes which perhaps haven’t seen it yet — the eyes of the press, of course! Just a little bit late, but Happy New Year everyone! Welcome to the Year of the Ninja! We’ve been too busy to say much over the holidays — we started 2016 with a bang at the Young Innovator’s Fair in Pennsylvania on January 2nd and 3rd, where hundreds of kids played Sneaky Ninja for the first time. This was easily the most amount of feedback we’ve ever gotten from younger players, since most events we go to are filled with more experienced gamers. One thing we’ve tried to focus on is accommodating players of all skill ranges with our different difficulty modes (Easy, Normal, Hard, and Very Hard), so we relished the opportunity to get all this valuable data about Easy mode and how it could be improved to be better suited towards its intended audience. Designing difficulties can be very, well, difficult — as very experienced gamers ourselves, we realized that we simply made it too hard for most kids! So how did we fix that? Today we have a small update for you about a few of the gameplay changes we’ve been making to Sneaky Ninja based on feedback from our alpha players and people from local events and conventions. Some of these have had a pretty big impact on the way people play, which goes to show the power feedback can have on a game’s development! For those of you who’ve played the alpha but never gave us any feedback, take note: these are the kinds of improvements that can happen when you tell us what you don’t like! Now, you can see a very visible boundary between light and shadow, which we’ve noticed has a significant effect on players: nobody wants to walk into the light anymore! That’s actually a very good thing to us. One of the difficult things about designing a stealth game is to convince people to play stealthily instead of just running through it like an action game. Before, people would eventually realize that running through doesn’t work, but only after dying ten times in a row and us telling them to try something else. Now, they naturally feel safer in shadows and less safe in the light, leading them to more quickly play the proper way. Spooky Sneak Peek and a Happy Halloween! Hope you’re enjoying the spookiest time of the year! 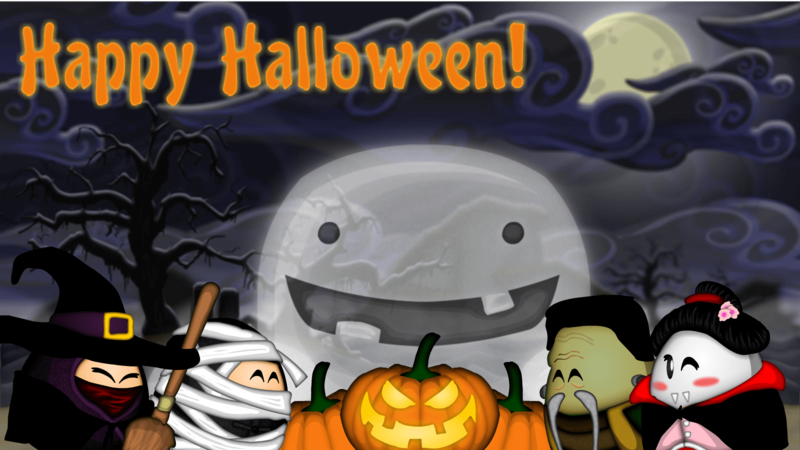 Our ninjas sure are, dressing up and carving some pumpkins with their big ghostie friend. He couldn’t help though — he has an unfortunate condition where he exists outside our physical realm. Poor guy. In the spirit of Halloween, here’s a peak at a spooky new level in Sneaky Ninja… Stranded on a haunted island, you have to use your lantern to ward off ghosts who’d like to make your visit a little more… permanent. Poor Taro… He can’t keep his hands from shaking! Don't miss out on a single Sneaky Ninja update! Join our 436 subscribers today! Support Sneaky Ninja's development through a Paypal donation!